The networks are getting faster and faster at pulling shows from the airwaves. Just when you think you’ve heard it all, they come up with something new. Well, how about pulling a show before it’s even been aired? Andy Barker P.I. is a new sitcom that’s scheduled to debut this Thursday night at 9:30pm on NBC. 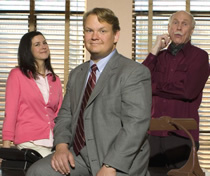 The series stars comic actor Andy Richter and was created by Conan O’Brien and Jonathan Groff. The series premise is that Richter plays a struggling accountant who reluctantly becomes a detective after moving into office space formerly occupied by a private investigator. The series co-stars Tony Hale, Marshall Manesh, Harve Presnell, and Clea Lewis. Richter’s had a string of bad luck with sitcoms since he left Late Night with Conan O’Brien seven years ago. It sounds like this show might be good enough to break that run. But, has NBC already made up its mind about the show’s future? Several weeks ago, NBC announced that they were reworking their Thursday night schedule. To accommodate the six week run of Andy Barker, P.I., freshman sitcom 30 Rock would be sitting out for six weeks and then return on April 19th. Well, NBC has now announced that 30 Rock is returning one week earlier which means one episode of Barker (the fifth) won’t air on network TV. Aaron Barnhart has speculated that NBC decided that this particular episode, which focuses on seniors played by regular Harve Presnell, and guests Ed Asner and (an aged) Amy Sedaris, has “too many geezers.” I suspect he’s right. Now the upside — for those in the U.S. with high-speed Internet connections anyway — is that the extra episode is being offered as an “online exclusive” at NBC.com. Actually, you can see the entire six episode series right now at the NBC site. They’re being sponsored by TurboTax software. Pretty good sponsor match. For those concerned about 30 Rock’s future, this seems like good news. Publicly, NBC has yet to make up its mind about a second season for the Tina Fey/Alec Baldwin sitcom. NBC has been behind the show from the start and this move seems to reinforce that support. Barring any unforeseen circumstances, I think it’s pretty safe to say that NBC will renew 30 Rock for a second season. What about the future of Andy Barker, P.I.? Hard to say but, even before it’s hit the airwaves, NBC doesn’t seem to have a lot of confidence in it. Stay tuned! first, Advent of old christine is a great show, If the networks would not moves shows so often then we would know where to find it. plus the networks keeps putting shows on hiatus, why is this? after a while you audience does not remember the show and our devotion to the characters are lost. Shows need to build an audience and that takes time. I like this show, Richter & Conan can’t connect with primetime audiences. I hope it sticks around, it breaks up the mainstream monotany. Like 30 Rock too, always felt it would do better on IFC or something ala Minor Accomplishments… Hope they keep it. Conan had another show that was never picked up in 1991 called ‘Lookwell’. It was shown on Trio (back when it was on tv, not online only). Interesting, because it was also a private eye show, but with Adam West. It was really funny, but pretty offbeat so it didn’t stand a chance.